It started with a story on National Public Radio about Viola Liuzzo, a civil rights worker who was brutally murdered by Ku Klux Klan members in Lowndes County, Alabama, hours after the historic March from Selma to Montgomery in 1965. The radio program included an interview with Viola’s daughter Sally, who mentioned that a playground named after her mother was in dire need of attention and repair. The Viola Liuzzo Playground, located in northwest Detroit, was dedicated in Viola’s honor in 1982. This is the story of the community effort to restore the park, and the role of PROSOCIAL in the creation and evolution of a growing group of individuals that has led the effort to complete the restoration. After a few conversations about the possibility of restoring the park, and realizing that the 50th anniversary of the March from Selma would be celebrated the following year, the author and her friend, Colette Mezza, members of the Detroit Downtown Runners and Walkers (DTRW), decided to go door to door in the neighborhood to see if there was a shared interest in moving forward. In June of 2014, small meetings began to take place in the front yards of the homes across from the park. The residents taking part live on the north and east sides of the park and are longtime homeowners going back to the 1960s and 70s. The residents on the west side appeared to be mostly renters and to this date have participated minimally. Holding the meetings in the park and in residents’ yards has allowed us to interact with the community. Other neighbors and passersby can stop and review plans and share their ideas. Out of these informal biweekly meetings with homeowners—Ricky, Lorraine, Jenny, and Merrick, and others—introductions were made and the history of the neighborhood was shared. Over the years the connections among neighbors have been altered, with high levels of renters moving to and from the area. There has been an influx of crime in the area, resulting in residents taking steps to lock up and protect their homes. The recent recession in Detroit, often locally referred to as “the Depression,” had taken a toll on this once thriving neighborhood, with overgrown grass taking over the park, along with signs of rising home vacancies and growing blight. Despite these challenges, this strong core group of homeowners have kept this community together. Our small group now also included Tracie, the youth director of nearby Gospel Tabernacle Church, which had adopted the park a few years back yet was having difficulty addressing the needed park maintenance. The church is one of several that have provided much needed services to area families during the recession. In the winter months, the park-restoration group meets in the church basement. In another meeting we used the Matrix 1 and clarified the values of the park (unity, respect, social justice, safety, openness, honesty), agreeing to review the values with the Liuzzo family to be sure they were congruent with Viola’s values and legacy. Also noted were the questions, concerns, and doubts that arose during this process. One of the concerns included the long history of numerous promises and attempts to restore the park and neighborhood by various groups and government organizations; all of those attempts had ended in disappointment. We discussed the need to keep ourselves aware of the concerns (“hold them gently”), while relying on our values to guide us as we moved forward These park values transferred well to our committee, which was now growing in membership and diversity (“This might be a decent time to let our values help navigate us through this conversation”). Out of these meetings came a plan to engage more of the neighborhood by having a Movie in the Park event. Everyone volunteered to bring food, chairs, and tables to the park. The group asked for assistance from a Detroiter a few miles south of the park who’d been featured in the local paper after he turned an abandoned lot into an outdoor movie theater for his two daughters and the neighborhood kids. Dan brought his projector and made a makeshift screen out of a tarp. When a source of electricity was not working, other neighbors offered to help, and DJ, who grew up a few homes north of the park, brought his generator. An entrepreneur who would soon be winning awards for his Motor City Popcorn start-up, DJ eventually joined the meetings and became treasurer. He shared how he grew up playing in the park and what an incredible influence this was on him as a child. Over the summer, one of the comments that kept arising was the need to talk with Mr. Johnson. Artis Johnson, a retired auto electrician and supervisor, has lived on the northeast corner across from the park since the early 1970s. He has been the primary person watching over the park and neighborhood. If the park needed mowing, Mr. Johnson and another neighbor would keep the grass cut. On the night of the movie, this author quickly learned of the important role Mr. Johnson plays in the community. During the author’s ninety-minute conversation with him in his front yard, nearly every person who drove or walked by acknowledged Mr. Johnson. Mr. Johnson was born and raised in Alabama and as a young man took part in desegregating the lunch counters. He was very familiar with Viola’s story and is dedicated to educating young people about her legacy and civil rights history. This neighborhood has long benefited from his consistent displays of respect, integrity, responsibility, and dignity. One of the most important moments in this project was having Mr. Johnson agree to join this process. Soon after, Paul Muelle, chief of natural resources and landscape architect of the local Huron Metro Parks, quietly volunteered to join the effort by developing the park design. He met with the growing group of involved neighbors and listened intently, taking notes for more than two hours while allowing everyone an opportunity to share their experiences and ideas. The primary desire was for a walking path. Many residents shared that they had to drive three miles north of the city to safely walk. The park path would allow them to walk at home. Two weeks later, Paul returned with the design and made revisions based on group feedback. Though altered slightly over the last year and a half, it remains the core model for the park. Having developed our park vision and core values, along with a park design, we were now in a position to begin publicly announcing our plans to restore the park. We had adopted the name Friends of Viola Liuzzo Park, and Ricky developed a Facebook page. We created a packet that detailed Viola’s history, a summary of our group, park plans and values, and the park design. We also created a list of organizations we wished to start reaching out to, starting with Detroit Parks and Recreation. The list also included those organizations relevant to Viola’s life. At the time of her death, Viola’s husband, Anthony, was a Teamster official, and Viola was a member of the NAACP and the Unitarian Universalist Church, as well as a student at Wayne State University (WSU). We set up meetings with the Teamsters, the Damon Keith Law School at WSU, and the NAACP. At this same time, our little group was evolving into a solid working unit, which was steadily attracting more community members. This included members of the local civil and human rights organizations, such as Dorothy Aldridge, a former SNCC leader who marched with Martin Luther King and is a board member of the Michigan Coalition on Human Rights (MCHR). MCHR would soon after publicly support this effort. Dorothy brings to the group her long history and wisdom of civil rights practices and values. Cheryl Buswell and her grandson, Robert, also joined the cause. Cheryl lived in Alabama and was subjected to intimidation and threats for being a white woman married to a black man. She eventually moved to Detroit and has been very active in neighborhood development. Robert is the youngest active member. Libbie Lamott Rutherford and Mary Wallace, both from DTRW, also joined the group. Mary discovered that her deceased uncle, a local priest, had officiated at Viola’s funeral. Libbie had previously worked with Greening of Detroit, an effective nonprofit promoting the development of environmental improvements in the city. She has been influential in creating collaborations with both Greening and UAW Ford. Carolyn Doherty joined and has emphasized the relationship between Viola and her best friend, Sarah Evans, a black woman who would raise Viola’s children following her death. Former residents of the neighborhood also returned and have been playing supportive roles. During this time, we reviewed Elinor Ostrom’s eight principles of effective groups that share a common-pool resource (CPR) 2. Although Ostrom’s principles weren’t a formal operational part of our approach at the time, we noted that we were using many of them. For example, we were committed to consensus-based decision making and value-based conversations. When discussing whether or not to include a basketball court in the park plans, all participants were allowed to express their perspectives. We are well aware of the painful stigmatization of young black males in the community. However, residents also have experienced having guns pulled out at the park in years past when there was a half court. We decided to delay a vote while conducting an informal study to locate publicly accessible basketball courts. It was determined there was an abundance of nearby basketball courts available. Also, we clarified that this city-owned park is designated as a playground for young children and a place for elders. After many thoughtful and respectful discussions, we voted to not include a court at this time, and to revisit this in the future. 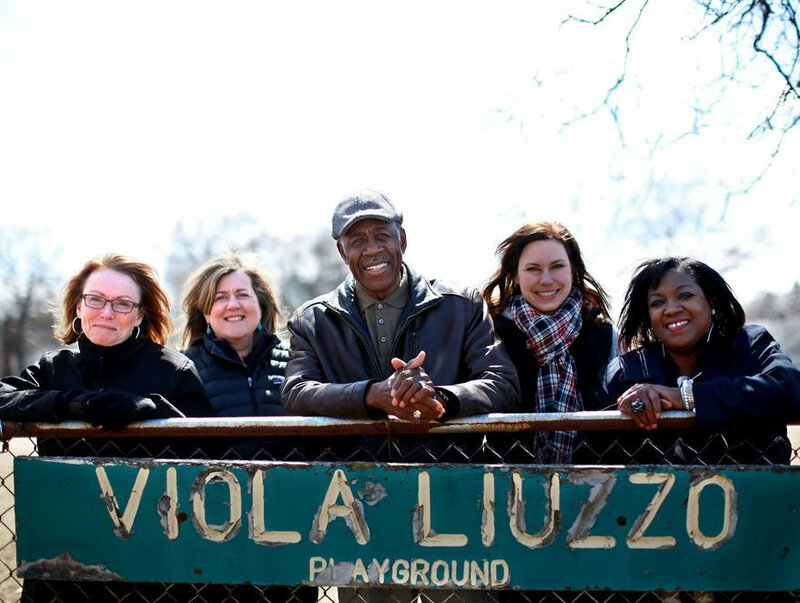 Our group identity was further solidified when the decision was made to file for nonprofit status and rename ourselves as the Viola Liuzzo Park Association (VLPA). Mr. Johnson was elected president of the board and Colette Mezza became the association’s secretary. Most importantly, our identity is also influenced by Viola’s legacy. Her courageous and bold decision to attend the march; her tragic, yet heroic sacrifice; and the horrific abuse of her family by J. Edgar Hoover and racist community members in the aftermath of her death are themes often brought up in meetings when facing tough decisions. A common refrain that has developed in the face of challenges that arise is, “What would Viola do?” We note the thoughts and feelings showing up around the table and move forward. Another area of awareness is our relationships with other individuals and groups, including the neighborhood, city departments, Viola’s family, and the media. We often discuss how we want to respond in a manner that reflects what we are all about. This has been evident in our work with Parks and Recreation. Since January 2015, we have been working very closely with this department. It has been a very rewarding, collaborative, and workable experience. The feedback we received included praise for our diverse group collective and how much project preparation we have accomplished. Detroit Water and Sewage Department (DWSD) is installing bioretention basins in the park which will help prevent the flooding of surrounding residential properties. VLPA and Greening, working with DWSD, will lead community plantings in the basins. The project has also benefited tremendously from the current vision of the city government to promote the redevelopment of area neighborhoods by restoring local parks. Recently, Detroit mayor Mike Duggan announced the city’s plan to restore Viola Liuzzo Park this year. During discussions of Ostrom’s principles, we agreed we scaled strongly in most areas, including: monitoring, polycentric governing, right to self-governance, and proportional costs and benefits. The only Ostrom principle we were unsure about was graduated sanctions. We agreed to review our use of the eight principles in the future. Full disclosure: the author has been trained in PROSOCIAL practices and has been open about this in our group. I refer to this project as “PROSOCIAL-lite” as I am an active member. When asked what fellow group members believe the roles of the author are in the group, some feedback included: liaising with some city departments and organizations, keeping our often-passionate conversations on track, and reminding us of our access to values when needed. One of the most moving experiences was the opportunity to meet Viola’s children: Penny, Mary, Anthony, and Sally (their brother, Tommy, could not attend). Both the suffering they endured following their mother’s murder and their perseverance in the face of unbelievable stigmatization by others over the last fifty years have been sources of inspiration for our group. Viola’s story continues to influence our group process as it has drawn people wanting to become connected to the project. City of Detroit officials share how they are reading books on Viola and viewing Home of the Brave, the 2004 documentary about her story. State representative Leslie Love was so moved she convinced her colleagues in the local Congressional Black Caucus and the Michigan legislature to support the allocation of state funds for the park construction. “We are willing to not only share our thoughts, beliefs, and opinions, but listen to others share their thoughts, beliefs, and opinions so the park and Viola’s memories are representative of the greatness of support within neighborhood communities. “The VLPA blends talents of many people who take time to learn about many topics from developing letterhead and fundraising to developing an entire park. This association is learning and fostering creativity to better one community park, and along the way, positively including so many others. With the current emphasis in Detroit on community collaboration, VLPA has partnered with Greening of Detroit to create a one-mile walking and biking path connecting the Viola Liuzzo Park to nearby Gorham Park. In response to a recent rash of violent deaths of eight young children, three of whom lived within a mile of the park, we are exploring what we want our role to be in the community in both acknowledging these tragedies and promoting a reduction in violence and healthier engagement in life. We are currently working on plans for a major event to be held later this year to celebrate the new park, Viola’s patriotic stand, and the coming together of this community. The Viola Liuzzo Park restoration is pure collaboration, commitment, dedication, service, community. It’s Detroit. It’s Viola. It’s love.